Well it seems that the last day of summer has transitioned to a nippy night last night, and oh how I love a crisp fall evening. We all know what comes next, our holiday preparations … are you ready? This beautiful paper is our Dashing Along Designer Paper and is combined with some of most popular holiday stamp sets. 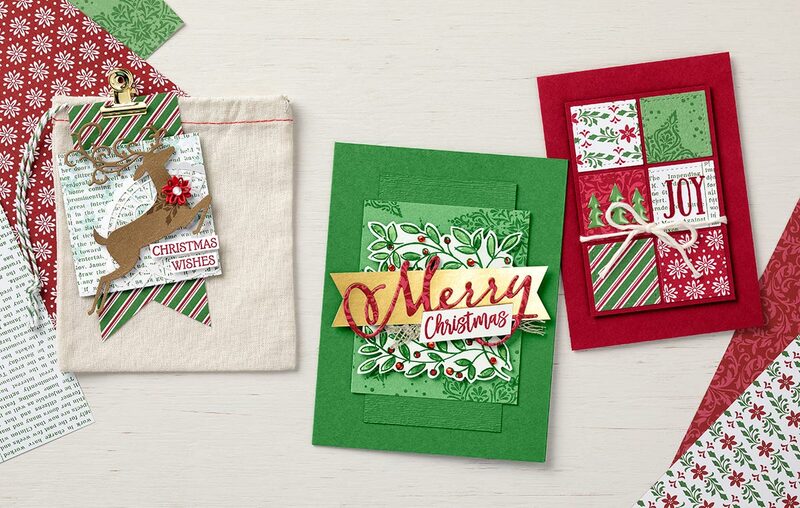 I would love to help you and your friends get prepared for your holiday cardmaking. You can get this gorgeous Dashing Along Designer paper for Free with a $250 stamping party. There are so many different ways to host an event; whether you invite your friends and family over to your house for an evening of fun, or invite them to my home for a stamp camp … we can set it up together. You bring the treats, I bring on the stamping. You let me know what you and your friends would like to see, we’ll design your event around your wants and needs. Let’s get you that free paper and some extra goodies! Let’s chat!